Dynamount demonstrates its app-based system of automated mounts for microphones at the 2016 Musikmesse. Lightning Boy Audio announces the availability of his 1401 Tube Mic Preamp and the Ghost Box dual tube phantom power. Radial's dual-channel phantom-power generator is now available. Radial Engineering debuts at NAMM 2014 the StageBug SB-48 dual-channel 48 volt phantom power generator. Radial Engineering will showcase at NAMM Show 2014 various new products, including the Relay Xo microphone signal switcher. 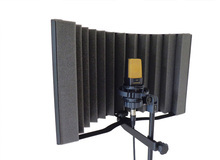 Canadian team Kaotica was at AES where they introduced the Eyeball, a new isolation system for studio condenser microphones. Radial Engineering adds to its catalog the ProMS2 single channel microphone signal splitter. AKG introduced the new B48 L box which provides condenser microphones with phantom power. The Tone Tank Mic Robot is a remote controlled tank that helps positioning microphones in the studio, or how a child's passion can become a pro tool.